I think Android has come a long way and is starting to be a serious competitor to Apple’s iOS. Looks likes the new “Jelly Bean” Android OS with the “Butter” project has addressed one of my other major issues, which is the lack of responsiveness. I currently have on my Samsung Galaxy S 4G running Gingerbread, which has this issue. And yes, that is the latest Android OS available for that phone. I have also seen this issue on other android devices, including tablets. So I really do hope that I do get to run Jelly Bean on my Galaxy S 4G. However, it doesn’t sound like I will ever get to. Which leads me to my next and biggest issue with Android devices. Upgrades?!! You don’t need no stinkin’ upgrades! It seems that if you buy an android device, you have to be OK with maybe or maybe not getting new versions of the Android OS. I’m sure not! Most people will only upgrade phones after their contract expires, which is usually two years. So, that means you could buy a phone and have two new releases of Android OS come out, before you get to upgrade. Those releases, again, you may or may not be able have. All those cool new features you read about in the news, aaah maybe, someday. Even if you do, you don’t get to have is pushed out to your phone in a supported way, for at least 6 months. That is, unless, you have one of the “google” phones. These reference design phones will always get the new OS releases first. So, those are the most popular models, because you know there are no manufacturers coming in between you and google getting you that latest and greatest stuff. The exception here seems to be the Samsung Tab 10.1, of which, 5,000 were given to developers to kick off the push for Android tablet app development. These were GIVEN to developers! However, the Ice Cream Sandwich release, which came out on October 19, 2011, is still not available for the Samsung Tab 10.1. The date I’m writing this is 7/17/2012, which is almost 10 months later, and the Jelly Bean OS, the release after Ice Cream Sandwich is already out. I know is possible to load it, but again, not in a supported way. So it seems that even if you by the Google reference device, you may go a very long time from announcement of a release to the world, to being able to use. No upgrades for new iOS for my 3 year old iPhone! Are you crazy! Now, imagine if Apple tried this. They announce iOS6 for this fall along with a new iPhone. You can get those new features today, if only if you buy the new model. What about the phone you just bought? You will be able to get iOS6 for that phone soon. Then, that soon turned out to be 10 months later. Do you think people would be pissed? Heck, they’d be pissed because the model before one you have doesn’t get to run it at all. Maybe I’m over estimating the need for upgrades. However, i think as users start get smarting about their phones, this is going to matter more. When they see their friends with iPhones get some cool new feature they like in the update iOS, which just showed up on their phone after plugging it in one day, they are going to notice this. Especially if they’ve been stuck with the same android phone and android OS for the last two years. When it’s time to get a new phone, they are seriously going to prefer an iPhone, especially if it available from their current carrier. I know hackers love the android devices, and I get that. If I wasn’t busier in life, and 10 years younger, I would totally be using the android phone and hacking it. The little hacking I do these days, is on laptops/desktops/servers/networks/virtualization. That’s where I keep my geek side happy, and I get paid for it. (I love that) For me, my phone is my everything device. I really don’t want to debug it or have to figure out what process is eating up the CPU and battery life on my freakin’ PHONE. I just want it to work and really, do everything for me. I do a lot on my phone, but hacking is not one of them. So what’s the solution? I’m not really sure. I think Google’s moves to tighten up the hardware standards is a good step in the right direction. However, I think on top of that, they need to work out a deal where users will get upgrades far at least X number of new versions. Or they could do it like other parts of the business world. Any new updates for your phone that is released within 1 or 2 years after you get your phone, will be pushed out to your phone within 2 months of any new releases. 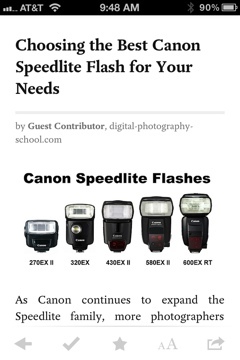 Or to simply things a little, they could use the release date of that model, instead of the purchase date. I know that Apple has no hardware manufacturers to worry about and they have different deals with the carriers. I don’t really care. When I buy something that is a portable computer, I want software upgrades too. Again, maybe I’m putting to much importance on keeping current with the latest, greatest and theoretically, more stable releases on my phone. Just to re-emphasis that Google not a good customer facing company yet, checkout the unboxing of the Nexus 7 montage video. Did no one at Google try unboxing the new packaging? I make a lot of use of RSS. Every website that has news that you’re interested in following has an RSS feed. The beauty of RSS is that makes it very simple to follow any website giving you the latest headlines and a snippet of the article that is posted. Google reader makes it east to use RSS. You can create a free account and add the RSS feeds to Google Reader. Almost all applications integrate with Google reader now. Most of the time I’m not actually using the Google reader interface, but it makes for a simple and easy way to have a central service tracking all of the news that you’re following, as well as the news that you’ve read and not read. (You can imagine why Google does this for free.) The RSS reader I’m using now, which I’m a big fan of, is feedly. Bonus, it’s free! I can quickly get through all the news using my phone or iPad by swiping sideways. When I find something I want to share with a specific person, I can quickly email them the link. If its something worth sharing with the world, I can tweet the link. I have systems in place that auto post anything I tweet to Facebook and Google+. Anything I find interesting that I don’t want to read right now, I mark to read later. I can do this in one touch with feedly, which is one of my favorite things about feedly. Read It Later, now called Pocket is fantastic! They have recently changed their business model, so it is also free. So, there is no reason not to give it a try. 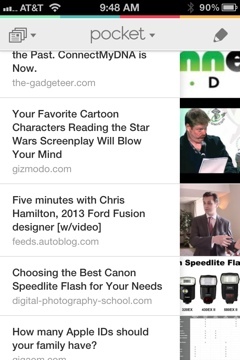 Most RSS readers have integration to mark something to be read later with this service/app. You can also use a bookmark for you mobile browser or plugins for your desktop browsers to quickly mark any page you come across to read later. So, besides a kind of centralized bookmarking system, why do I love it? Two reasons. 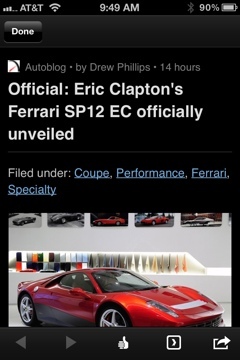 It gives me a view of the article that is optimized or reading and watching video clips. This means I can focus in the text and pictures without seeing all the ads and other distractions. All of this is accessible anywhere! There are fantastic apps for iPhone, iPad, Android, and any web browser. On mobile devices I can see this content offline too. Meaning, I can read news on a plane without wifi. Especially handy as my iPad is wifi only. I can mark articles read and when I get online again, the read status is synced to the servers and any newly marked articles to read are downloaded. Wake up, check my email. After that I go to feedly. Swipe, swipe, mark to read later with a touch, swipe, swipe, forward via email, swipe, swipe, tweet, swipe, etc. I power through my news. Later, when I’m really awake and ready to really read the news I found interesting, I go to Pocket on any device. Read what I feel like. Maybe email it or tweet it and then mark it read. I then read whatever else looks interesting at that time and then go on to some real work. What I love about this flow is that I can catch the headlines of the day, so I’m not out of the loop, without committing a ton of time. I’ve also marked all the things I might want to read later without feeling like I have to or feeling like if I don’t bookmark or read the info now, it will be lost forever. Anyway, that is my flow. I’m very please with it, so I thought I would share. Amsterdam, like Seattle has potable water according to the KLM personnel that work there and some blog that Jason found. Jason and Nicholas both drank potable water from the Amsterdam airport bathroom sink. Both of them were fine and did not have any problems. Jason had one drink of water and Nicholas drank about 5 bottles (so 20 oz.) We were told by the locals in Munich that their water from the sink was also potable but we did not test that out. In Czech Republic and Poland we used bottled water. All water that is mineral water is from some spring and the source has a different mineral combo. The water that is the closest in taste to our tap water in the states is “natural from a spring” vs. “mineral”. “with gas” in Poland will tend to be on a red tag “Gazowana” and “not with gas” will be blue “Niegazowana” (similar in Czech Republic), or in German “mit” means “with”, “ohn” means “without”. We did once give Nicholas mineral water without gas that tasted very mineral-y but he did not mind one bit. Nicholas still does not have the eating of solid food down so we had to use formula for a one year old. In the United States mostly Emphamil and Symilac, the big two, make toddler formula, and its a good idea to throw in a pound of it in your check in baggage since you don’t know when or where you will find it. In the US its packaged in a round container with a plastic lid, in Europe its in a aluminum bag encased in a cardboard box with a smaller scoop. The ratio is one small Euro scoop for 30 milliliters of water, you don’t have to boil the water water as long as its potable. Most bottles in US have milliliters as well as ounces. In Poland the brands are Bobovit and Bebiko. For a one year old its “3 junior” and on the bottom it will say from what month “od 8 miesiecy” or “od 9 miesiecy” (8 months or 9 months), or “od 1 rok” (one year). In Germany and Austria the main brand is Nestle, which is also available in Poland and it also has a large number on the box to indicate the next step of nutrition as well as the months on the bottom. Nestle 3 was what we used. If your child is allergic to milk/ milk based formula and you need a special sensitive or soy formula you will have to bring your own supply for the duration of your stay. We did not see any soy milk formula for babies or toddlers in any of the countries we visited. There is baby food in jars and you can guess by the pictures on it what fruit it is, the various cereals however required cooking the water and we did not experiment in mixing them with potable water. We learned a lot on this trip regarding traveling with a one year old. Some of this information I wish I knew before we left. Since its 2 am and I can’t sleep because I am not adjusting to Seattle time these next postings will be in sections of “lessons learned” in between naps. We called a few months before our flight to reserve a bulk head seat for Jason and I and a basinet that attaches to the bulk head for Nicholas so that he could sleep in it. We were not told much, just that it was all reserved. When we got to the airport nothing was reserved. Lesson one: don’t just call a month in advance, call a second time 24 hours in advance. When we called a month before to buy Nicholas a ticket we gave our credit card information and were told that a ticket was bought for him but when we arrived at the airport there was no record of that and we were holding up the airplane from leaving trying to buy him a ticket. Lesson two: when you call 24 hours before the plane leaves also ask if your credit card was charged for the baby ticket and if they have it on the records that you have purchased a baby ticket not just that you are traveling with a baby, the child needs his/hers own ticket (about a fraction of yours in cost, or half of yours in cost if they will have their own seat on the plane). On the way back from Amsterdam to Seattle we finally got bulk head seats allowing Nicholas to crawl around by us comfortably and us being able to get a bottle ready for him while not standing in a sardine can space. Finally we were going to see the mythical airplane basinet and put him down in it for a nap, until the flight attended said “oh he is big, how much does he weigh?”. Lesson three: the airplane basinet is for babies roughly up to 6 months in age and can handle up to 9.6 lb of weight of a laying down baby. We have not seen one since Nicholas did not qualify for it but were told that its not like a play pan, its not that sturdy hence it can only accommodate a sleeping infant. What surprised me was that once Nicholas fell asleep while sitting on my lap facing out with my hands around him (fingers locked tightly), I also fell asleep for an hour without my hands unlocking, apparently I even snored. We got about 3 hours of sleep on Friday night since we were packing and eyeballing how much weight was in each suitcase. At 2:30 we woke up, got the last of our stuff together, and drove to the airport to give the car back to the rental agency and catch our flight. The Ford Focus had about 4,000 kilometers on it when we rented it. When we returned it the car had about 8,000 kilometers on it if not more, plus mud, grass/wheat on the undercarriage from driving through a wheat field and a forest, the windshield had a collection of bugs, and the cab of the car had crumbs from all kinds of snack food. We thoroughly used it. The flight from Warszawa to Amsterdam was one hour and 40 minutes. We learned that when going to USA through Amsterdam or through Zurich the passengers can not take any liquids on board, but any other airport and that is not a problem, so if you have some bottle of water you bought in Warszawa that you were hopping to drink in Amsterdam and on the plane to Seattle you might as well chug it in Amsterdam before getting through security. Yes, you go though security again in Amsterdam even thought you are only transferring to go further and you already went through security in Warszawa and were already thoroughly patted down and discovered that the wires in your bra set off the metal detector. So, we went through security again and entertained Nicholas for an hour in the waiting area as he gave a concert to all of the passengers waiting with us for the plane to Seattle with the lyrics being “Ba, Ba, Ba”. The plane from Warszawa to Amsterdam was operated and owned by KLM. The flight attendants were very nice, once again giving us a special seat belt for Nicholas, it was awesome the care they extended to us and to our baby. We would fly KLM again but it appears they are limited on their operations on the west coast of the US. The plane from Amsterdam to Seattle was 10 hours and 10 minutes. Nicholas slept 2 or 3 times in between socializing with his neighbor, the 21 month old Eliot. We were in the bulk head this time which was great, the two toddlers could easily walk and crawl around under our careful supervision and we were also comfortable. We did not get the bassinet because as it turns out it can only contain a 9 kilogram baby and Nicholas is 10.5 kilograms and he is too long for it. The bassinet I was told tends to accommodate babies 6 months or under. The trip went overall well. As I write this I am in Seattle, we arrived at 11 something today and I am falling asleep at the computer. It was a tiring day. I’ll write more tomorrow. Thursday afternoon we arrived in Lodz, the city where I called home till I was 10. I have not been to certain parts of this city since childhood. Jason, Nicholas, and I parked at my old elementary school, painted since the last time I saw it. The old store and office complex next door has aged significantly, but the post office from which I would call my Mom after school was there, and so was Stokrotka – the little restaurant where I would sometimes go for potato dumplings. I could see the 13 story building where I lived on the 10th floor (we don’t count the first floor in Poland since that is 0, so in Polish its 12 stories, and I lived on 9th). The highlight of walking around in this old neighborhood was the forest where my parents would take me for walks, to the giant sandbox near the play area, or a play day in the forest with school. There are many paths in the forest and its not the kind of wild forest where animals live and you can’t see other people’s feet in front of you because its not thick at all. This is the kind of forest that was most likely planted about 50 years or os (my guess only) because the vegetation is thin on the ground, it was a great place to play and not get lost. The next day we walked down Piotroska street, a little shopping, a large mid day meal in a traditional Polish food restaurant and of course ice cream at the “Hort Cafe”, where I use to go with my parents to celebrate birthdays. The ice cream sundays where incredible. Will upload pictures soon. And that was the last day in Poland. On Friday evening we drove to Warszawa, packed and then woke up at 2:30 am on Saturday for our 6 am flight home. On Monday we left grandma Halinka, aunt Bogusia (my Godmother), uncle Krzysiek, and cousins Artur and Renata, and all the family on my Dad’s side that came to Renatka’s wedding. It was a hard day, but then goodbyes are always hard. How can we know when we will come back again and for how long. I was trying to fit three years of catching up into three days during which there were wedding preparations, a wedding, and then recovery time. I managed to hang out a little bit with everyone, but it did feel like a speeding express train skipping over tracks. We drove 3 hours from the village of Piaski, near the town of Lututow, to the town of Tarnowo Podgorne near the city of Poznan. At the end of the day we saw my uncle Mietek, aunt Krystyna, their daughters with husbands and children: Gosia – husband Jacek and son Ziemek, and Kasia – husband Krzysiek and son Kacper. It was a house full of children and grandchildren for uncle and aunt and with me, Jason, and Nicholas it was even more louder. In the next two days, Tuesday and Wednesday we saw grandpa Jozef at noon and aunt Krystyna and uncle Mietek with family in the evening. Dziadek Jozef lives on the farm where he moved with his wife and children about 40 years ago. His son Piotrek works the farm with his wife Renata and their children David, Lukasz, and Evelina who is married to Marcin and has a daughter Nichole. The last three were on vacation at the Baltic Sea. We chatted, watched Nicholas play with everyone, and ate good Polish food. On Tuesday Jason, Nicholas and I drove to Rogalin to see the palace there, only to discover that the palace is closed till September for renovations. It was 5 pm and the castle in Kurnik near by would have probably been closed too. Plus it was late, we were tired and the bugs were eating us alive. We are sick of the bugs, not just the mosquitoes but all the other country bugs that take nibbles at us. We also miss our own bed and basement where we can escape the heat, there is no escaping it here. Yesterday we said our goodbyes. Today is Thursday and we are driving to Ludz, where I lived till the age of ten at which point I came to United States. Till next time. We are now the third day in my Dad’s family’s region of Poland. First day we relaxed in the Piaski village where Grandma Halinka lives with my aunt Bogusia (my godmother), and uncle Krzysiek, their son Artur and daughte Renatka. Renatka just got married yesterday. Today we are recovering. At a Polish wedding it is possible to drink over 10 shots of vodka in a night and wake up without hand over. How you ask. Well there is a formula to this fun madness. First you eat, then you toast to the happy couple and make them kiss, next you make fin of them for kissing badly by singing songs about it ( all the gusets in unison at the same time) and you make them kiss 5 or more times, then you dance. Next you eat more, drink more vodka an play some wedding games, and dance. You reapeat this process every hour and drink nothing but vodka, coffe, hot tea, and the ocasional juice. You end the party at 6 in the morning, wake up at 11 and start over again more slugishly now. And here we are, slumped over coffe and a fabulous breakfast, I don’t know how Polish women stay thin after weddings like this. On a few hours there will be dinner and the waiters have already replace the empty bottles of vodka with fresh ones for today. In Poland dinner is between 1 and 3, the evening meal is supper. Nicholas slept through most of the church wedding ceremony, and then he danced with everyone at the wedding. Finaly crashed at 10, our borrowed video monitor lasted for an hour (we acidentaly fried our baby monitor due to voltage being higher then it could handle) so I went to bed at 12 and Jason kept on going till 4. We both had a great time. Jason just stepped back inside from a quick game of after wedding volley ball game and Nicholas is napping in the banquet hall in his stroller as I type this and drink more coffe. Vienna is huge and when the hotel porter gave me the city map I just about hyperventilated. I’m suppsed to find a museum in all this? Well, the Old Town actualy fit on only one rectangle of the fold out map, which after finaly finding I felt a great big sense of relief. At this point in the trip we had the growing fatigue fighting with our enthusiasm, so walking all over the huge city did not appeal to us. We saw three museums over the course of two days. The Klum….. museum was similar to the Louve, it was large and it was best to pick a section that we really wanted to see first and add on to that later. The Secession museum was started by the modern artists suceeding from the tradional style on Vienna hence it has changing contemporary exhibits on it’s two top floors and the permanent large fresco in the basement by Gustav Klimt done in his Gold period. It is a tribute to Bethoven’s fifth symphony starting with floating women signyfying longing for happiness. As the eye moves to the right the story unfolds. Klimt is not for everyone and Jason was not impressed but I loved it. The last museum, also in my opinion the most worth it was the Belvedare palace. It has a garden, currently in the process of being renovated, as well as exhibits in the lower and upper level. We went to the upper Belveder, the home of Gustav Klimt’s “The Kiss”, which was amazing. I had no idea that it was that large. The painting was very well lit and surrounded by some of his othe works including “Judith”. The museum also had a lot of works by Egon Shiller, some by Hofman, a Reniuar, Monet, and others. That evening Nicholas surprised us by sleeping through dinner and letting us enjoy a nice Austrian beer and dinner. The next day we were in the car for 8 hours driving to grandma’s house. It was a hard trip on Nicholas. That much time in a car was too much. We have done so much walking in the last two days. Oh do my feet hurt, but my knee does not. It’s a little sore but it’s nothing compared to my feet. I’m very glad that I got the knee surgery before this trip. There is no way that I would have been able to do any of the walks on this trip if I did not get my knee fixed first. So, day one in Munich was laundry and getting lost in old town. Day two was the Deutche Miseum. It is a science museum, very popular with kids. There were many sections: mining, electricity, avionics, paper making, ship models, pieces of ships marine and space, windmills, trains, turbines, engines, computers, maps, bridges, ect. Soooo much stuff. Jason was geeking out to his heart’s content, especialy by the computer science section. We spend over two hours there and could have easily spend more, but Nicholas needed some crawling time. In the evening we walked to the Augustiner Beer Garden under the trees. It was one of those places that we pictured when thinking of traditional Germany: waitresses in traditional long skirts, vests and aprons bringing one-liter glass mug onto a wooden table as people sing, eat sausages and chat. The beer was light, only one kind but it was soo good and refreshing that we did not need another. We split the first liter and the second liter I accidentaly got mixed with lemonade (popular with bicyclist since it has less alcohol and cyclists get the breathelizer test in Germany too). We got some ribs and a giant pretzel, all good, pretzel was soft and lightly crunchy. It was awesome food. This particular beer garden had an area for children to play, with tables around it for parents. Nicholas was fascinated by the laughing and running tots from one to 8 years old. We let him do a little investigation on his own with us closely by. What is nice about a place like this is that we had an opportunity to talk to other parents. The couple with whom we shared a table with had two children, the wife was Spanish and the husband French. We had a great time talking to them for over two hours on life in germany, parenthood, politics in America, you name it. Nicholas fell asleep in his stroller and sleept in it for an hour as we had an adult conversation. He did not even wake up as we brought him back to our room. Day three in Munich we managed to squeeze in both the Audi museum and the BMW museum. We drove and hour outside of Munich to get to the Audi museum. It had an impressive set up inside. Once Jason uploads the pictures you will know what I am talking about. Since it was Sunday we could not get the factory tour since no one was working. At the museum Nicholas finaly had a fit. He cried and twisted his body aroud when in stroler, when held, when standing. For a few minutes there was no consoling him. He finaly calmed down but I had to carry him around everywhere. He bahaved a little better at the BMW museum, but overal it was not his beast day. The BMW museum was fascinating on the outside but on the inside not all parts were accesible to folks on wheels, so with Jason’s help I was able to see it all but a person in a wheel chair would not. We ended the day with a walk around the Olympic park constructed for the 1970’s Olympics. Yes the Olympics when the Jewish athletes were murdered and once I realized that: the park felt eerie for a moment. The moment passed and we enjoyed a walk outside in the greenery after all day in either a car or in buildings with exhibits about cars. Finaly the evening bugs tries to eat us alive and we had to head back to the hotel.